Honestly, I cant even believe I got this post together. After spending the better part of yesterday in an airport amidst delays and more delays, I was exhausted and maybe just a wee bit cranky. Re-entry on the home front is always difficult, especially after a lengthy absence. Of course there would be a few annoying surprises waiting for me. That’s always fun. This is all compounded by the fact my computer had crashed a couple weeks ago and caused me to lose all the Potato Ho Down entries previously sent to me! I’ve had to reconstruct, email, borrow, beg…you name it. I hope I’ve gotten it all right and not missed an entry, a name, a picture…some things were left out because they were lost. If I have…email it to me! She’s back, Madame Spud, Ms. Potato Ho herself. She’s here to oversee this month’s Potato Ho Down (PHD) Roundup. Isn’t she pur-tee? I think she has new fishnet stockings on especially for today’s event. I would like to say thank you to everyone who participated in this month’s event. It’s always so fun to see everyone’s potato creations. This round up is something Krysta (Evil Chef Mom) and I came up with as a way to honor our all time favorite vegetable and accept our existence as Potato Ho’s. The rest is history. This event will continue to make it’s way around the blogosphere every third Wednesday of the month. I hope you will all continue to join in for the fun. If you are interested in hosting this event (even if you’ve already done it) on your blog…LET ME KNOW. Now as stated in the rules for this event everyone had to submit their recipe with their Potato Ho name, (their first pet’s name and their middle name). For me that would be, Sparky Marie. I swear the names crack me up. Our first entry comes to us from The Daily Spud, a blog out of Ireland. How appropriate for all things potato. The Daily Spud felt there couldn’t be a better Potato Ho name and is sticky with that one. I would have to agree. According to this 19th century recipe, this Potato Bread, with its addition of mashed potato to yeasty bread makes it moist, light and great for toasting. Beautiful isn’t it? This Goat Cheese and Potato Pizza comes to us from Madame Potato Ho Bellini Valium from More Than Burnt Toast in British Columbia, Canada. Is this to die for or what? 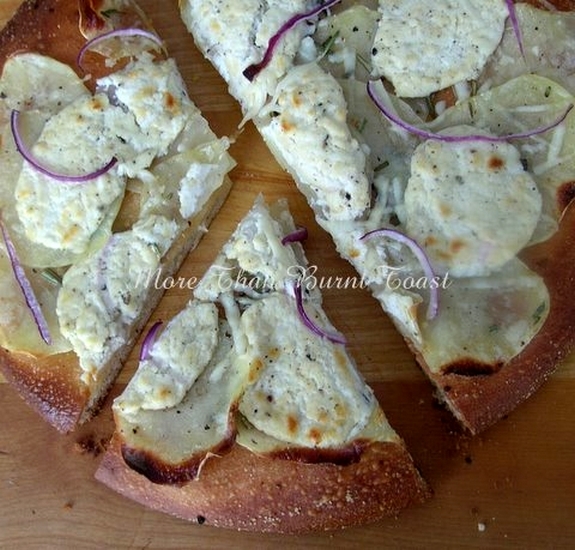 “This is a hearty pizza, the double carb hit of dough and potato works really well. I absolutely loved this combination. Could it be because I am really just a Potato HO Spoken like a true Potato Ho, thanks Val! Now for something totally off the wall. Madame Potato Ho Blackie Cat from Baking and Boys located in Kansas has put together this Almond Joy Candy made with mashed potatoes. I swear it’s true. I think this might make her famous. 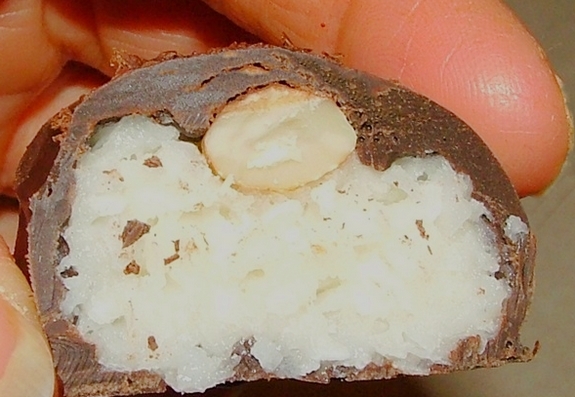 “You would never know there are mashed potatoes in the coconut filling.” Amazing. She is a true Potato Ho. Bless her. This next dish, a lovely Potato and Green Bean Salad has been sent to us by Madame Potato Ho Chad Denise from The Duo Dishes in Southern California. Isn’t it lovely? “Buttery potatoes, crisp green beans and a handful of dill pair nicely in this light dish.” I would have to agree, it looks amazing! Madame Potato Ho Lollipop Anne from The Cutting Edge of Ordinary in Rhode Island, sent over this Swiss & Cheddar Potato Bake. “This is a creamy, cheesy melt in your mouth, it’s so damn good you will heat it up again for breakfast kinda dish. 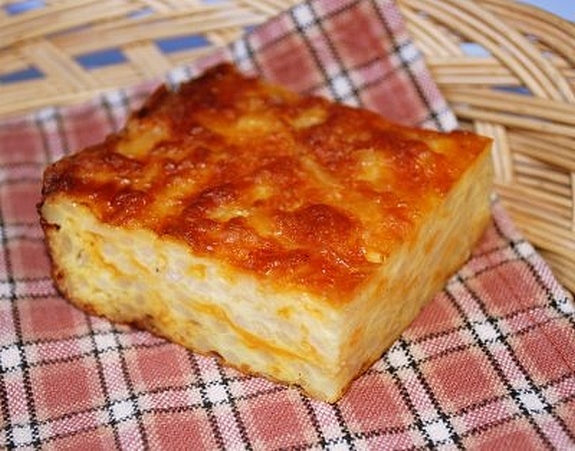 It’s like one big cheesy hashbrown with a crusty top.” Yeah, and we will all be trying it! Yum! Here is one of my entries. I am known as Madame Potato Ho Sparky Marie and these are my Sweet Potato Wedges with Sesame-Soy Dipping Sauce. All Potato Ho’s appreciate a good wedgie, so give these a try. 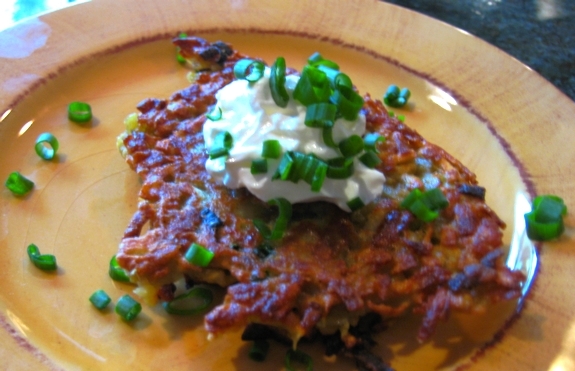 Sent over by Madame Potato Ho Kartoshka from 5 Star Foodie Culinary Adventures in Virginia, these Crispy Dilled Potato Cakes are beautiful! 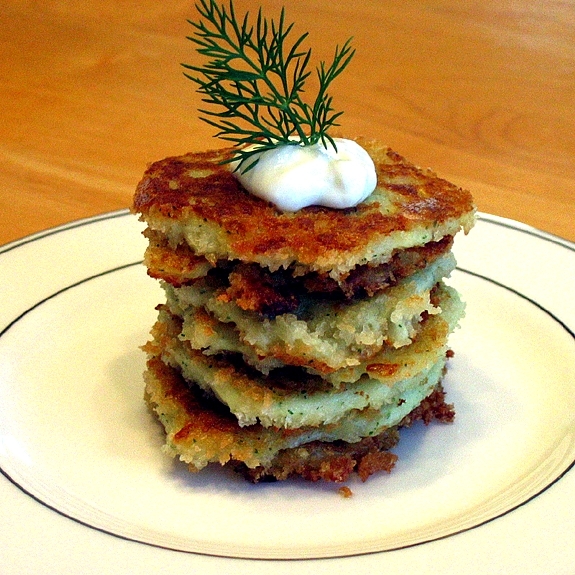 “These delicious potato cakes are creamy and delicate on the inside and crispy on the outside.” I can’t wait to try these! 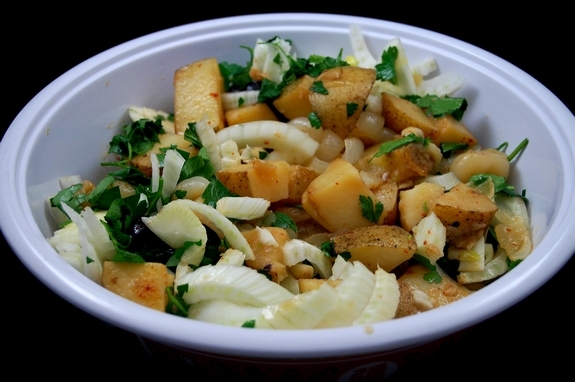 What Potato Ho wouldn’t love this Potato and Cippolini Onion Salad sent over by Madame Potato Ho Minette Mary from Fearless Kitchen. “A relatively easy and healthy side salad, perfect for a dinner party or barbecue.” Very nice! Is this the cutest Potato Ho entry ever? 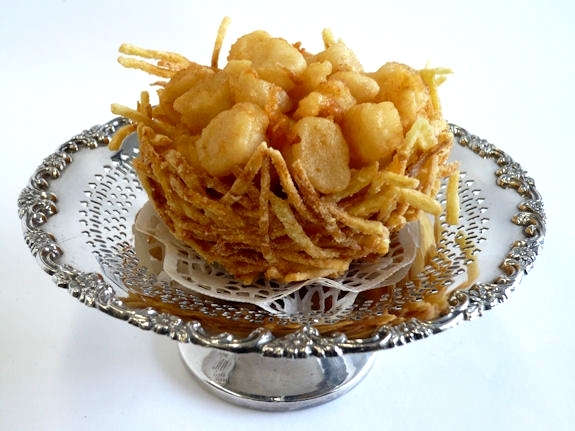 Madame Potato Ho Yum Cha Cha Cha from Kit’s Chow in Vancouver, Canada sent over Scallops in a Potato Nest. I am so impressed I can’t even believe how adorable this is. “These bird’s nest are ecologically-friendly. No baby birds were harmed in making the nests.” I love it! For Valentine’s Day Madame Potato Ho Jinkie Marie from Spinach Tiger whipped up these His and Hers Eggs Wrapped in Potatoes and Spinach. Is this not the perfect package? Simply beautiful. “I think a crispy potato wrap has to be one of the most satisfying and unique ways to wrap food, striking a balance between elegant because of it’s beauty, and rustic because it has comfort food satisfaction.” I couldn’t agree more. Are these not some beautiful spuds? Madame Potato Ho Waldo Ann from Panini Happy in Southern California sent these over. 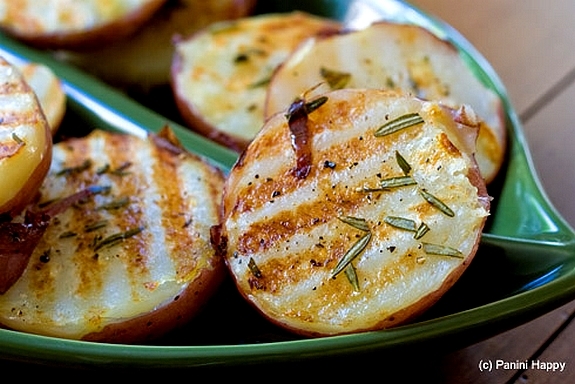 These Grilled Rosemary Potatoes are “Crisp on the outside, soft on the inside – grilled red potatoes with olive oil, sea salt, pepper and rosemary.” Wow. The Duo Dishes‘ Madame Potato Ho Chad Denise also sent over another entry, Warm Sweet Potatoes and Chickpea Salad with Tahini Dressing. 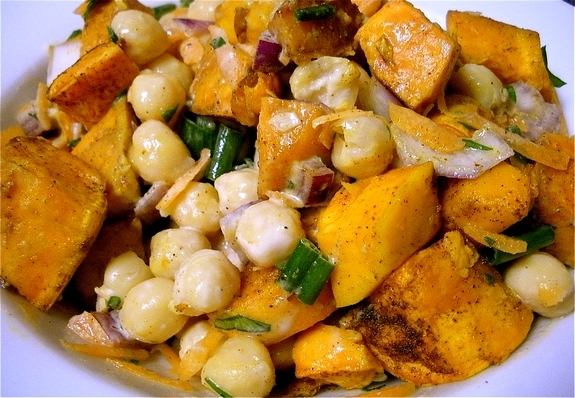 “Sweet potatoes and tangy lemony tahini really pop in this dish. It’s great for a dinner at home and lunch the next day.” Nice one eh? Yes, a man can be a Potato Ho too. Mr. Potato Ho, Puddleglum Brent, from Cooking Stuff sent over Crash Hot Potatoes-Three Ways. Oh the jokes I could make here…hmmm. “Cheesy, bacony, garlicky, soft, crispy potatoes.” Oh yeah. This is not a mirage. 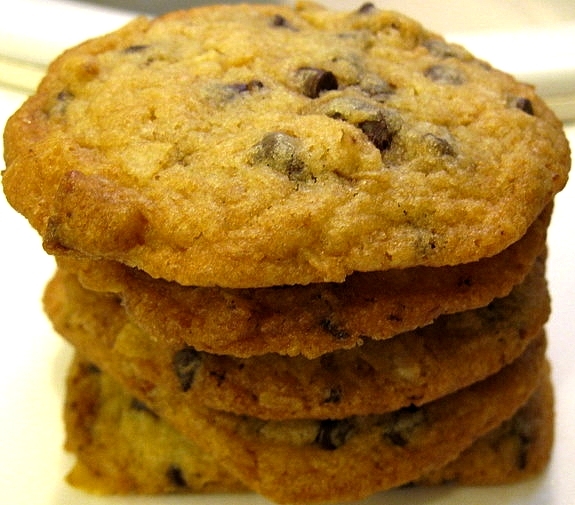 These are Potato Chip and Chocolate Chip Cookies. Madame Potato Ho Tiki Christine from Vanilla Sugar in Cape Cod, Mass sent these over. Are these perfect or what? Every Ho Down needs dessert! It’s all in the dollop isn’t it? My partner in crime Madame Potato Ho Christina Shane of Evil Chef Mom in Northern California has been cooking up Sweet Potato Latkes. Are they beautiful or what? Go read her crazy and hilarious story. She never fails to entertain. Love the color here. 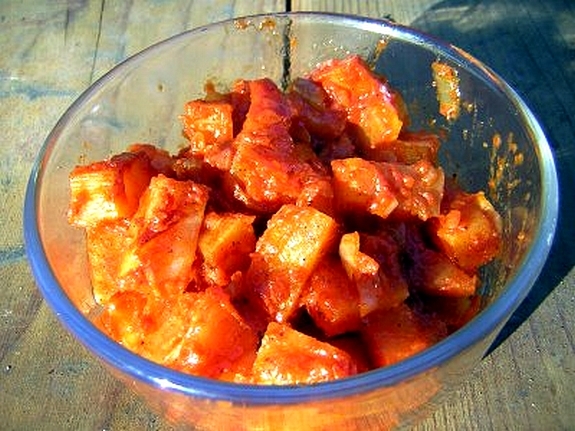 These Potatoes ala Sofrito were sent over from Cupcake Muffin in Berkeley, California. ”They’re tomato-y, saucy, and absolutely delicious. I think they’re particularly good for breakfast or brunch (or breakfast-for-dinner), maybe with some sausages, eggs, and biscuits.” I lost her Potato Ho name in the computer crash! Bummer. I think this could be the best looking salsa I’ve seen in a while. 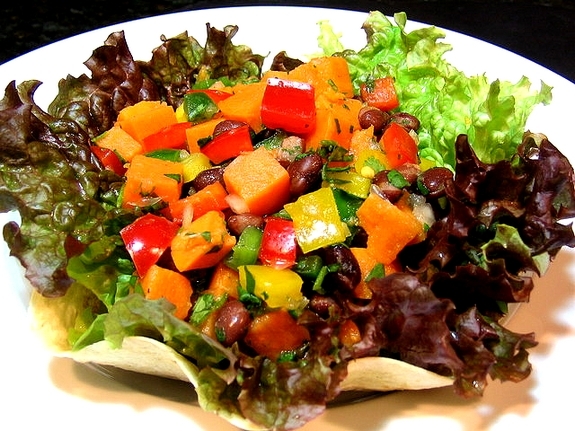 This Sweet Potato and Black Bean Salsa comes to us from One Perfect Bite in Oregon. “If you’re tired of gray vegetables and tinned tomatoes I hope you’ll try this. It will give a real lift to your palate. 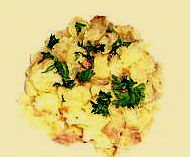 While I serve the salsa in tortilla bowls, that really isn’t necessary – it does, however, add pizzazz to the presentation.” This another Potato Ho entry I could not totally reconstruct due to the crash…so, sad. Collard Cannon with Ale-Braised Onions and Raw Milk Cheddar; honestly the name left me speechless. Is this cool or what? Madame Potato Ho Bosco Lei from Burp! Where Food Happens in Wisconsin sent this over. “Who said comfort food can’t be healthy? 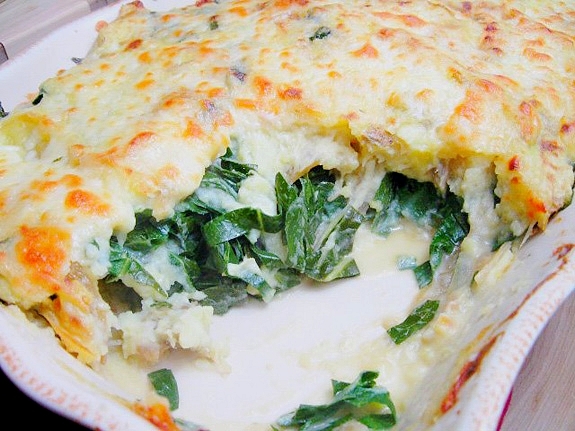 Get your greens in this potato dish featuring layers of Yukon golds, onions, tangy cheese, and collard greens.” Yum. Elra from Elra’s Cooking in California made this amazing Sweet Potato Gnoochi. I just love the way it looks! Thanks Elra, I think it’s perfect looking! And here is my second entry into the Ho Down, Sparky Marie’s Ranch Mashed Potatoes. “Tastes like ranch dressing without all the fat.” Perfect wouldn’t you say? Thank you everyone for participating…it was a blast as usual! Ok, this has to be your best round-up ever!!! All the recipes are simply sublime!!! OOOOOOoooooo! I love it when you shower down upon us all that is good in the world. I will be having fun with some of these!!! Can I be an honorary ho? I just like the name. What category will be next? Italian maybe…I know, CHICKEN SALAD!!! Kudos for making it through all adversity! Great recipes – especially curious about the cookies. I want to be a taster for this event! 😉 Rolling through the pics and reading your descriptions left me in awe at the creations … and it also left me salivating, of course! Wow, fantastic recipes in this Hoe Down. I don’t know where to start. Love them all. Wow, so many great potato dishes all on one page! This is such a fun event! Wow! some great entries. I can’t wait to try them all. I’ve pulled too many extra shifts to get my act together this month, but I’m ready for next month! Darn! I’ve just gained 10 lbs. looking at all these wonderful potato delights! Wow! Nicely done as always and the spuds look great! Where to start? Where to start? So I just bought 15 pounds of potatoes for $3 and have no idea what to do with them–that is, until I saw this post. Thank you! oh my, all these potato dishes….I’m lucky my keyboard is working right now with all the drool! Great entries! I’m in potato heaven! All of these recipes look crazy good, but that Almond Joy candy made from mashed potatoes looks insane. I would have never imagined anything like that! 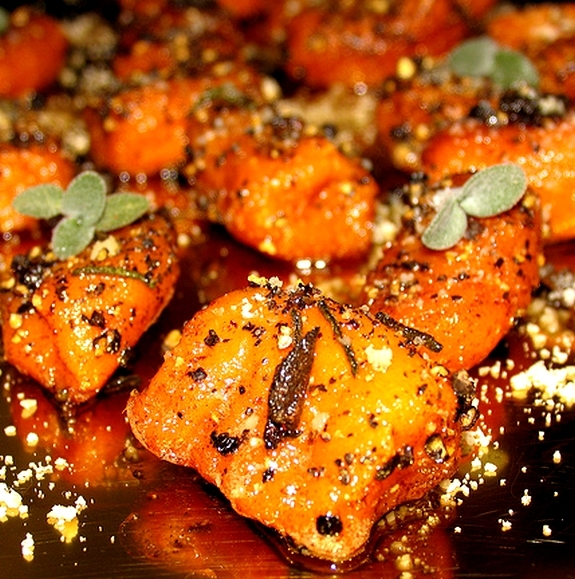 Great round-up, Cathy – I’m dying for those sweet potato gnocchi… and, and, and… they all look fantastic! This post killed me. EVERYTHING looks so good. I will have to bookmark some of these. Thanks for the best round up ever! Those are beautiful entries, unbelievable how many dishes you we create from the humble potato. Well done everyone… and of course thank you so much to you Cathy for hosting this month event. Knowing better . . . I drolled over each and every entry! I HAVE to get some potatoes cooking! Gorgeous pictures & fabulous entries! Maybe sometime my brain will remember to send my entries in on time. However, my recipe would pale in comparison to these great cooks. I so want to do this and wasn’t sure how to go about it exactly….there have been some great recipe’s…and since I’m a coconut freak…I have to try the mashed potato almond joy…I do â™¥ your ho name…I don’t have a middle name…so I’ll have to come up with somethin’ good and hoish!!! Wow..those are all so creative, seriously! 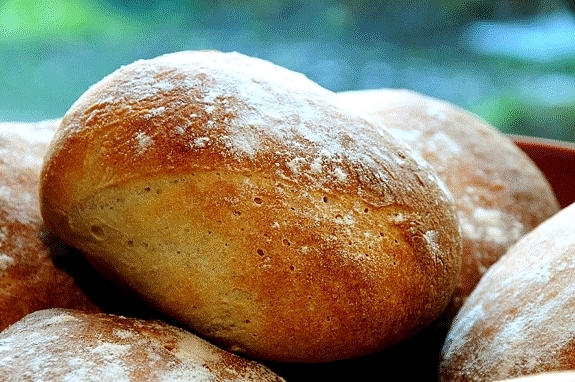 I’m especially drawn to the potato bread as I made some once when I was young and single and it was so yummy! I feel the urge for a baked potato now. OMG–those are some great entries! I’ve got me eye on a few of those to make!! I hope you all don’t cause another potato famine. It all looks delicious! Where to start? What a great event. I’m drooling over all the pictures. Mmm. They all look delicious. Hope your day is better today. This is cruel – I haven’t eaten lunch yet and this is making me SO hungry. They all look so delicious, although if I had my pick right now I would go for the latkes. I recently made a chowder that included sweet and regular potatoes too – very tasty. This is an outstanding roundup! I can’t wait to try the recipes. Looking forward to next month’s event. My potato ho name is Diesel Dawn. He He! Great roundup. Thanks for doing this. The recipes all look fun, although I don’t know how much I would like an Almond Joy made with potatoes! BTW, I loved your lemon coconut cake recipe. I’m already looking at is a birthday treat for a coworker in the future. I am hungry just looking at all of this! Sorry we missed this one. We only made boiled potatoes (plain; well, with butter) and mashed potatoes (again, plain!). Seriously, all that amazing potato-ness in one post … I’m practically drooling … Your blog always brightens my day! A totally amazing roundup. My favorite is the cookies! 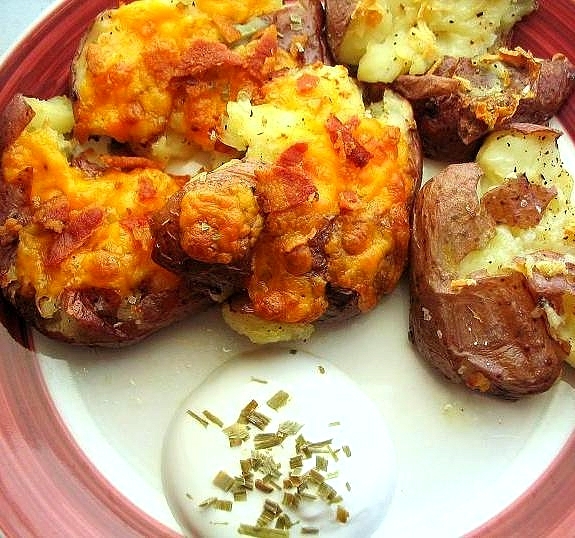 I bookmarked a couple of these fantastic potato recipes Cathy! WONDERFUL!! Oh lurdy!!! OK, the sweet potato gnocchi, potato chip cookies and goat cheese potato pizza have got to be on our plates immediately. Actually, everything on the list! WOW this is what you do when your tired, stressed out, and a little bit cranky? You are tired and you did all this? You are amazing. The potatoes in my cupboard are crying because I didn’t do anything with them. Great work everyone! What yumminess! Thanks, Cathy! Can’t wait to try some of these. My Potato Ho name would actually be Blackie Katrina, as I go by my middle name, but I thought Blackie Kat sounded better, and yes, Blackie was a cat. Great work getting them all posted! Whoa! This is an awesome round up! That candy bar had me totally fooled, and those sweet potato gnocchi looked terrific. They all looked terrific! Every single one … love the potato scoops! Fabulous roundup! And again, so many great potato dishes. We just missed the cut-off for this round (just did a potato dish this weekend). We’ll be sure to come in on time next round. Way to go, potato ho! Incredible roundup – Thank you for hosting and creating. Wonderful dishes not sure where to begin with all these great choices!! So many excellent ideas for a Ho like me to try. I cfould eat something new everyday!!!! Dude, these are so not going to help my waist. You have such a wealth of recipes here. Yours is a place to visit often. I agree with the first comment I read – this roundup just keeps getting better. 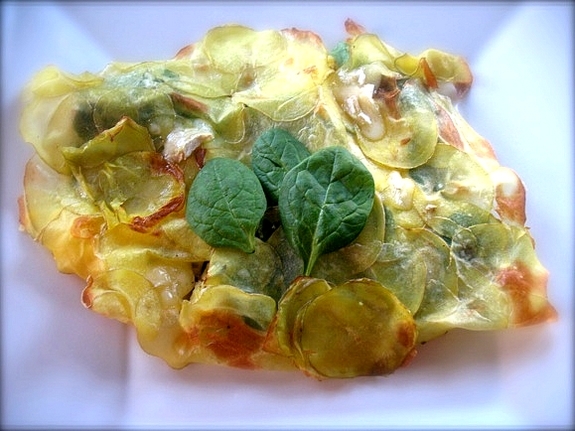 I am constantly amazed by the things people are doing with potatoes that actually make me WANT to eat more potatoes!! Great job all around, everyone. Wowza. Hi. My name is Danielle, and I am a Potato Ho. 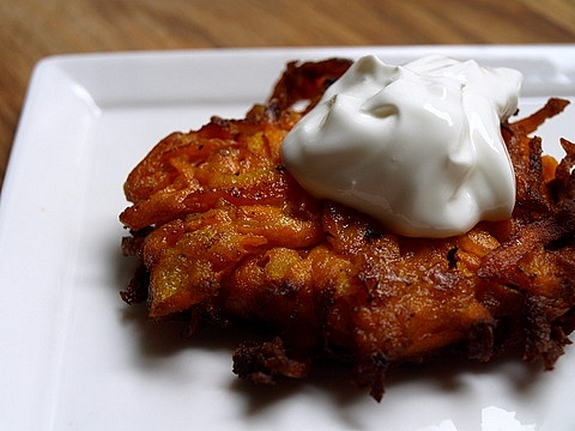 I am literally drooling on my desk just looking at all of these potato dishes…OMG! I have to buy potatoes on my way home from work, yes I do! By the way, I made the Chocolate Chip Toffee cookies and they are delish! My hubs (and me!) can’t stop eating them!